Dwaraka or Dvārakā (Sanskrit: "a gate or a gateway"; also known as Dvāravatī, "the many-gated city") is the capital of the Yadavas who ruled the Anarta Kingdom. The city was situated on the western point of Gujarat, and is submerged in the sea as per the volume 16 of the epic Mahabharata. Dwaraka is one of the holiest city in ancient India and one of the 4 main "dhams" along with Badrinath, Puri, Rameshwaram. Dwaraka was a city-state extending upto Sankhodhara (Bet Dwaraka) in the north and Okhamadhi in the south. Dwaraka was also known as Dwaravati. It was also a port-city, having trade relations with many sea-faring nations. It could be that this ancient port-city was a gateway for foreign sea-faring kingdoms into the Indian mainland and vice versa. The territory of Dwaraka includes the Dwaraka Island, many neighboring islands like the Antar Dwipa and the mainland area neighboring the Anarta Kingdom. The kingdom was situated roughly in the north-western region of Gujarat state. Its capital was Dwaravati (near Dwarka, Gujarat). The Mahabharata does not mention Dwaraka as a kingdom but rather as the capital city of Yadavas who ruled the Anarta Kingdom. It was founded by a clan of Yadava chiefs who fled from the Surasena Kingdom out of fear of king Jarasandha of Magadha. The territory of Dwaraka included the Dwaraka Island, many neighbouring islands like the Antar Dwipa and the mainland area neighbouring the Anarta Kingdom. Dwaraka was a federation of many republics rather than a kingdom under a single king, the title of king of the Dwaraka-confederation being only titular. Within the Federation of Dwaraka were included the states of Andhakas, Vrishnis and Bhojas. The Yadavas ruling Dwaraka were also known as Dasarhas and Madhus. Prominent Yadava chiefs residing in Dwaraka included Vasudeva Krishna, Bala Rama, Satyaki, Kritavarma, Uddhava, Akrura and Ugrasena. THE ancient city of Dwarka, situated on the extreme West Coast of Indian territory, occupies an important place in the cultural and religious history of India. The fabulous architectural planning of the Dwarka temple has attracted tourists from all over the world. The town has association with Lord Krishna, who is believed to have founded this town by reclaiming 12 yojana land from the Sea. During its glorious past, Dwarka was a city of beautiful gardens, deep moats, several ponds and palaces, but it is believed to have submerged just after the death of Lord Krishna. Due to its historical importance and association with the great Indian epic Mahabharata, Dwarka continues to attract archaeologists and historians besides scientists. Ancient Sanskrit words like pattana and Dronimukha have been generally used to describe coastal port cities where national and international ships and boats were harbor. The oldest reference to the Agade harbour comes from the Mesopotamian text which mentions that boats from Meluhha used to be anchored in Agade harbour, datable to the mid-3rd millennium BC. Archaeological excavations brought to light a jetty at Kuntasi in Gujarat dating back to Harappan period. Similarly, excavations have revealed a dockyard and a few stone anchors at Lothal, another Harappan site. There are several literary references mentioning ports at many coastal sites during the early historical period (2500 to 1500 yrs BP), but archaeological remains of these ports are scanty. Most of the settlements were situated either on the river banks or on the banks of backwaters, which would have served as an excellent natural harbour. These locations being highly vulnerable to floods and other natural disasters, it is not surprising that only scanty evidence for their existence remain. Excavations at Poompuhar brought to light, a wharf situated on the bank of the old course of the river Kaveri. Similarly, onshore excavation at Elephanta Island yielded a wharf dating back to early centuries of the Christian Era. There is evidence to suggest that the present Bet Dwarka jetty has been used as a harbour since the early historic period. In the early eighties an important archaeological site was found in Bharat, at Dwaraka, the site of the legendary city of Shri Krishna. Dwaraka was submerged by the sea right after the death of Shri Krishna. This inscription refers to Dwaraka as the capital of the western coast of Saurashtra and still more important, states that Shri Krishna lived here. The discovery of the legendary city of Dwaraka which is said to have been founded by Shri Krishna, is an important landmark in the history of Bharat. It has set to rest the doubts expressed by historians about the historicity of Mahabharata and the very existence of Dwaraka city. It has greatly narrowed the gap in Indian history by establishing the continuity of the Indian civilization from the Vedic Age to the present day. Now fresh archeological evidence has surfaced proving beyond reasonable doubt the existence of the historic city of Dwaraka, and throwing light on the lives of people who inhabited the "City of Gold". This is hallowed ground-the city over which Krishna ruled. Gujarat dates back to pre-historic times, here exists one of the three largest dinosaur sites of the world that include clutches of eggs that date back 65 million years. But interest in Jurassic Park notwithstanding, for devout Indians, Gujarat is closely linked with one of India’s most enduring avathara — Krishna. Excavations at Dwaraka that began in 1981 helped add credence to the legend of Krishna and the Mahabharat war as well as provide ample evidence of the advanced societies that lived in these areas-the Harappan settlements that represent some of the world’s greatest civilization. One of the first outposts to be excavated, soon after independence was in the Ahmedabad district. Evidence suggests that these settlers brought with them a highly developed culture that was rich not just in the arts but in the sciences as well. The emphasis was on a well-organised society based on trade that was conducted through their ports. Dwaraka, for example was a well-planned township, its harbour consisted of a rocky ridge modified into an anchorage for berthing vessels, a unique feature in harbour technology that was in use even before the Phoenicians attempted this in the Mediterranean sea much later. The man-made holes in the ridge and the large stone anchors lying there suggest that large ships used to be anchored there while smaller boats carried men and cargo up the river. "The findings in Dwaraka and archeological evidence found compatible with the Mahabharata tradition remove the lingering doubt about the historicity of the Mahabharata," … "We would say Krishna definitely existed." These evidences prove beyond doubt that Kusasthali, a pre-Dwaraka settlement did exist in Bet, Dwaraka. Archeologists have concluded that this early settlement of Kusasthali was first occupied and fortified during the Mahabharata period and was named Dwaraka. After realizing that the narrow terraces were not sufficient for the increasing population, a new town was built a few years later at the mouth of the river Gomati. This planned port city was also called Dwaraka, further adding credence to the fact that the Mahabharata was not a myth but an important source of history. Shri Krishna is better known in India’s cultural and religious history as the King and Emperor of Dwaraka. According to ancient Hindu texts, Dwaraka was a new country founded by the Yadava clan of chiefs who fled from the Surasena Kingdom due to fear from the king Jarasandha of Magadha. It was the brainchild of Vasudeva Krishna, the great personality of the Dwapara Yuga. Shri Krishna was born at midnight on Friday, July 27, 3112 BCE as per the date and time calculated by astronomers on the basis of the planetary positions on that day recorded by Sage Vyasa. Shri Krishna — the protector of Mathura, the lord of Dwaraka and the reciter of the Bhagavad Gita on the battlefield of Kurukshetra is one of the most enduring legends of Bharat. Are Krishna and Dwaraka actual historical entities? For a majority of Indians, the answer is an unequivocal yes. Some archaeologists and historians too are now willing to accept that the common man's faith does have a basis in fact. Shri Krishna is a towering personality and it is difficult to separate the human aspect of his life from the divine in Krishna concept. He is a grand mystery and everyone has tried to understand him in his own way, according to his spiritual light or vision. As a fighter he was without rival, as a statesman most shrewd, as a social thinker very liberal, as a teacher the most eloquent, as a friend never failing, and as a householder the most ideal. "The yellow glitter of the golden fort of the city in the sea throwing yellow light all round looked as if the flames of vadavagni came out tearing asunder the sea." Before the legendary city of Dwaraka was discovered some scholars were of the view that the Mahabharata being only a myth it would be futile to look for the remains of Dwaraka and that too in the sea. Others held that the Mahabharata battle was a family feud exaggerated into a war. Excavations done by Dr. S. R. Rao at Dwaraka prove that the descriptions as found in these texts are not to be discarded as fanciful but are to be treated as based on actualities as seen by their authors. The architecture of the old Dwaraka of Shri Krishna is majestic and wonderful. Dwaraka on mainland which was one of the busiest ports of the Mahabharata Period met a sudden end due to the fury of the sea. 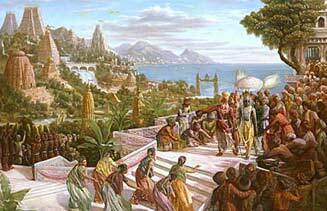 After the Mahabharata War Krishna lived for 36 years at Dwaraka. At the end, the Vrshnis, Bhojas and Satvatas destroyed themselves in a fratricidal feud at Prabhasa but Krishna did not interfere to save them. The portends of destruction seen by Shri Krishna who advised immediate evacuation of Dwarakaare stated in Bhagavata Purana. Dwaraka abandoned by Hari (Krishna) was swallowed by the sea. The submergence took place immediately after Shri Krishna departed from the world. Fearing attack from Jarasangh and Kaalayvan on Mathura, Shri Krishna and Yadavas left Mathura and arrived at the coast of Saurashtra. They decided to build their capital in the coastal region and invoke the Vishwakarma the deity of construction. However, Vishwakarma says that the task can be completed only if Samudradev, the Lord of the sea provided some land. Shri Krishna worshipped Samudradev, who was pleased and gave them land measuring 12 yojans and the Lord vishwakarma build Dwaraka, a "city in gold". This beautiful city was also known as Dwaramati, Dwarawati and Kushsthali. Another story says that at the time of the death of Shri Krishna, who was hit by the arrow of a hunter near Somnath at Bhalka Tirth, Dwaraka disappeared in the sea. The importance of the discovery of Dwaraka lies not merely in providing archaeological evidence needed for corroborating the traditional account of the submergence of Dwaraka but also indirectly fixing the date of the Mahabharata which is a landmark in Indian history. Identical pottery is found in the submerged city of Dwaraka. Thus the results have proved that the account in Mahabharata as to the existence of a beautiful capital city of Dwaraka of Shri Krishna was not a mere figment of imagination but it did exist. Mahabharata War took place on November 22, 3067 BCE and the Bhagavad Gita was compiled around 500 BCE. "The sea, which had been beating against the shores, suddenly broke the boundary that was imposed on it by nature. The sea rushed into the city. It coursed through the streets of the beautiful city. The sea covered up everything in the city. I saw the beautiful buildings becoming submerged one by one. In a matter of a few moments it was all over. The sea had now become as placid as a lake. There was no trace of the city. Dwaraka was just a name; just a memory." The town has association with Shri Krishna, who founded this town by reclaiming 12 yojanas of land from the sea. During its glorious past, Dwaraka was a city of beautiful gardens, deep moats, and several ponds and palaces (Vishnu Purana), but it is believed to have submerged just after the disappearance of Shri Krishna. Due to its historical importance and association with the Mahabharata, Dwaraka continues to attract archeologists and historians besides scientists. Since 1983 the Marine Archaeology Unit of the National Institute of Oceanography is engaged in the offshore exploration and excavation of the legendary city of Dwaraka in the coastal waters of Dwaraka in Gujarat. The strongest archaeological support comes from the structures discovered under the sea-bed off the coast of Dwaraka in Gujarat by the pioneering team led by Dr S.R. Rao, one of Bharat's most respected archaeologists. Dr. Rao has excavated a large number of Harappan sites including the port city of Lothal in Gujarat. For instance excavations in Bedsa (near Vidisha in Madhya Pradesh) have unearthed the remains of a temple of 300 BC in which Krishna (Vasudeva) and Balarama (Samkarshana) are identified from their flagstaff. Krishna's son Pradyumna, grandson, Aniruddha and another Yadava hero, Satyaki, have also been identified. A more recent historical record, dated 574 AD, occurs in what are called the Palitana plates of Samanta Simhaditya. This inscription ref ers to Dwaraka as the capital of the western coast of Saurashtra and states that Krishna lived here. The foundation of boulders on which the city's walls were erected proves that the land was reclaimed from the sea about 3,600 years ago. The epic has references to such reclamation activity at Dwaraka. "The findings in Dwarka and archeological evidence found are compatible with the Mahabharata tradition and removes the lingering doubt about the historicity of the Mahabharata. We would say that Krishna definitely existed"
The Dwarakadhisa Temple prompted the setting up of a Marine Archaeology Unit (MAU) jointly by the National Institute of Oceanography and the Archaeological Survey of India. Under the guidance of Dr. Rao, a great marine archaeologist, a team consisting of expert underwater explorers, trained diver-photographers and archaeologists was formed. The technique of geophysical survey was combined with the use of echo-sounders, mud-penetrators, sub-bottom profilers and underwater metal detectors. This team carried out 12 marine archaeological expeditions between 1983 to 1992 and articles and antiquities recovered were sent to Physical Research Laboratory for dating. By using thermo-luminescence, carbon dating and other modern scientific techniques, the artifacts were found to belong to the period between 15th to 18th century B.C. In his great work, The Lost City of Dwaraka, Dr. Rao has given scientific details of these discoveries and artifacts. 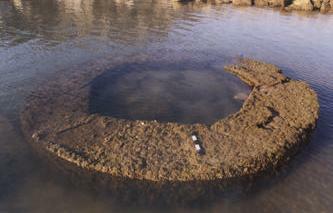 A circular stone structure exposed during low tide off Dwarka. Between 1983 to 1990, the well-fortified township of Dwaraka was discovered, extending more than half mile from the shore. The township was built in six sectors along the banks of a river. The foundation of boulders on which the city's walls were erected proves that the land was reclaimed from the sea. The general layout of the city of Dwaraka described in ancient texts agrees with that of the submerged city discovered by the MAU. "The discovery of the legendary city of Dwaraka which is said to have been founded by Shri Krishna, is an important landmark in the history of India. It has set at rest the doubts expressed by historians about the historicity of Mahabharata and the very existence of Dwaraka city. It has greatly narrowed the gap of Indian history by establishing the continuity of Indian civilization from the Vedic age to the present day." (S.R. Rao, former adviser to the NIO who is still actively involved in the excavations). Although the adherents of western, empirical science date Dwaraka to 1443 B.C. or roughly 3,400 years ago, ancient Vedic astronomical texts and present-day practitioners of the Vedic tradition assert that the current epoch of Kali-yuga began in 3102 B.C. Shri Krishna's disappearance and the subsequent submergence of Dwaraka occurred shortly before this date. Therefore, Dwaraka can be no less than 5,000 years old. Rao said that if a fraction of the funds spent on land archaeology were made available for underwater archaeology, more light could be shed on Dwaraka, which had much archaeological significance because it was built during the second urbanization that occured in India after the Indus Valley civilization in northwestern India. Dwaraka's existence disproves the belief held by Western archaeologists that there was no urbanization in the indian subcontinent from the period between 1700 B.C. (Indus Valley) and 550 B.C. (advent of Buddhism). As no information was available about that period, they had labelled it the Dark Period. Among the objects unearthed that proved Dwaraka's connection with the Mahabharata epic was a seal engraved with the image of a three headed animal. The epic mentions such a seal given to the citizens of Dwaraka as a proof of identity when the city was threatened by King Jarasandha of the powerful Magadh kingdom (no Bihar). The foundation of boulders on which the city's walls were erected proves that the land was reclaimed from the sea about 3,600 years ago. The epic has references to such reclamation activity at Dwaraka. Seven islands mentioned in it were also discovered submerged in the Arabian Sea. "The findings in Dwaraka and archeological evidence found compatible with the Mahabharata tradition remove the lingering doubt about the historicity of the Mahabharata. We would say that Krishna definetely existed." S.R. Rao. Could a tsunami have struck the coast of Gujarat in 1,500 BC to drown the ancient city of Dwarka? Experts and others closely associated with the discovery of the lost city off the coast of Saurashtra don't discount this possibility. They speak of the Mahabharata talking about the sea suddenly engulfing the city after Shri Krishna's death and Arjuna taking Krishna's grandsons to Hastinapur. 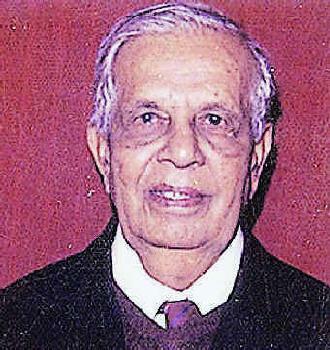 Well known marine archaeologist SR Rao worked on Dwarka for 14 years with the National Institute of Oceanography, Goa. 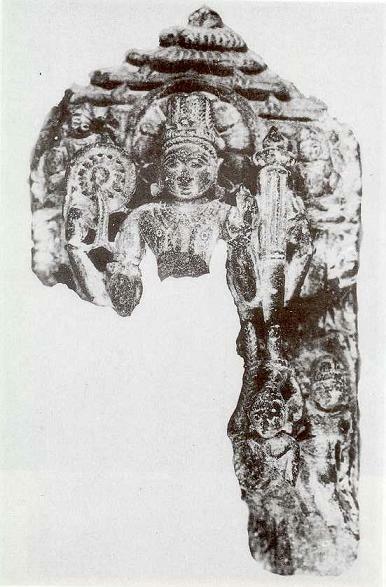 Sculpture of Vishnu from onshore excavation, Dwaraka. Talking to TOI from Bangalore, Rao says, "We can't rule out the possibility of a tsunami drowning ancient Dwarka as the town was inundated by some sea activity. There are shlokas which talk of the suddenness of the incident and the gravity of the calamity". "The Bhagvat Purana mentions ‘Ete ghora mahotpata Dwarvatyam yamaketavaha. Muhoorthamapi na atra no yadu pungava'. The literal translation is ‘This calamity itself became a symbol of death. The Yadavas should not stay here even for a moment'. The suddenness of the present tsunami has caused similar devastation to what seems to have happened at ancient Dwarka and its inhabitants." But he also says that "there are three texts including the Harivansha, the Matsyapurana and the Bhagvat Gita, which state that it took seven days to vacate Dwarka before it was submerged by the sea. "If we suppose that Dwarka submerged due to a tsunami, the gradual movement of the sea can't be explained". Director of the state archaeology department YS Rawat, too, believes that a tsunami could well have done to ancient Dwarka what it did to Aceh. "It is just that in the ancient times such sea activity was not known as tsunami. It is possible that large waves like that of a tsunami struck Dwarka and drowned it," he says. "In fact, near the sea of today's Dwarka, one can find remnants of Harappan culture during low tide." But here are three texts including the Harivamsa, the Matsya Purana and the Bhagavat-gita, which state that it took seven days to vacate Dwaraka before it was submerged by the sea. If we suppose that Dwaraka submerged due to a tsunami, the gradual movement of the sea can't be explained. Swami Sadanand Saraswati, the secretary of the Shardapith Dwarka says, "Yes, Dwarka was devastated by the sea. According to the Bhagvat Gita, the Ekadash Skand mentions Krishna sending a message to the people of Dwarka. He told them that once he leaves this world, there would be no one on this earth to save Dwarka. The sea would finish Dwarka and hence he asks the 56 crore Yaduvanshis to leave Dwarka". THE QUEST: An underwater archaeologist of the ASI examines an ancient structure off the shore of Dwaraka; a circular structure on the shore at Dwaraka; fragment of an ancient structure found underwater; remains of an ancient structure in the forecourt of the Dwarakadhish temple. 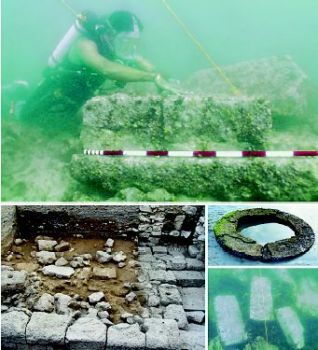 Ancient structural remains of some significance have been discovered at Dwaraka, under water and on land, by the Underwater Archaeology Wing (UAW) of the Archaeological Survey of India (ASI). Alok Tripathi, Superintending Archaeologist, UAW, said the ancient underwater structures found in the Arabian Sea were yet to be identified. "We have to find out what they are. They are fragments. I would not like to call them a wall or a temple. They are part of some structure," said Dr. Tripathi, himself a trained diver. Thirty copper coins were also found in the excavation area. The structures found on land belonged to the medieval period. "We have also found 30 copper coins. We are cleaning them. After we finish cleaning them, we can give their date," he said. Dwaraka is a coastal town in Jamnagar district of Gujarat. Traditionally, modern Dwaraka is identified with Dvaraka or Dvaravati, mentioned in the Mahabharata as Krishna's city. Dwaraka was a port, and some scholars have identified it with the island of Barka mentioned in the Periplus of Erythrean Sea. Ancient Dwaraka sank in sea and hence is an important archaeological site. The first archaeological excavations at Dwaraka were done by the Deccan College, Pune and the Department of Archaeology, Government of Gujarat, in 1963 under the direction of H.D. Sankalia. It revealed artefacts many centuries old. The ASI conducted a second round of excavations in 1979 under S.R. Rao's direction. He found a distinct pottery known as lustrous red ware, which could be more than 3,000 years old. Based on the results of these excavations, the search for the sunken city in the Arabian Sea began in 1981. Scientists and archaeologists have continually worked on the site for 20 years. The UAW began excavations at Dwaraka again from January 2007. Dr. Tripathi said: "To study the antiquity of the site in a holistic manner, excavations are being conducted simultaneously both on land [close to the Dwarakadhish temple] and undersea so that finds from both the places can be co-related and analysed scientifically." The objective of the excavation is to know the antiquity of the site, based on material evidence. In the offshore excavation, the ASI's trained underwater archaeologists and the divers of the Navy searched the sunken structural remains. The finds were studied and documented. On land, the excavation is being done in the forecourt of the Dwarakadhish temple. Students from Gwalior, Lucknow, Pune, Vadodara,Varanasi and Bikaner are helping ASI archaeologists. In the forecourt, old structures including a circular one have been found. A small cache of 30 copper coins was discovered. Among the objects unearthed that proved Dwarka's connection with the Mahabharata epic was a sea engraved with the image of a three-headed animal.The epic mentions such a seal given to the citizens of Dwarka as a proof of identity when the city was threatened by King Jarasandha of the powerful Magadha kingdom (now Bihar).The foundation of boulders on which the city's walls were erected proves that the land was reclaimed from the sea about 3,600 years ago. The epic has references to such reclamation activity at Dwaraka. Seven islands mentioned in it were also discovered submerged in the Arabian Sea. Pottery, which has been established by thermo-luminescence tests to be 3,528 years old and carrying inscriptions in late Indus Valley civilization script; iron stakes and triangular three-holed anchors discovered here find mention in the Mahabharata. Old shipwrecks-like that of the Titanic-which have been lying buried under the sea with their precious treasure along with the submerged city of Dwarka off the Gujarat coast, for centuries, could soon vie for the status of an underwater world cultural heritage site. Over 200 experts from 84 countries, who gathered under the aegis of UNESCO in Paris recently to examine a draft convention on the issue, unanimously agreed that underwater cultural heritage was in urgent need of protection from destruction and pillaging. The submerged city of Dwarka is believed to be an important site having both historical and cultural value for Bharat. Legend has it that the remains-the wall of a city is clearly visible while the rest is yet to be discovered-are in fact, that of the ancient city of Dwarka mentioned in stories of Shri Krishna. The proposed underwater museum at Dwaraka, the first of its kind in the world, and a marine archaeology museum will throw more light on the Indus Valley civilisation and enable researchers to peep into the history of the lost city of the Mahabharata era. The Marine Archaeology Centre and the National Institute of Oceanography have jointly submitted a proposal with technical details for the preservation of the site to the Gujarat government. As per the proposal, marine acrylic tubes would be laid through which visitors could pass and view the remains of the historic city from windows. Acrylic walls could also be made which could be accessed by boats. Dwaraka, the submerged city in the Arabian Sea, off the Gujarat coast, is well connected with the other parts of the country. The entire nation and even foreign countries are anxiously waiting for the preservation of the submerged city, which is not only of historical importance, but also of emotional interest since its founder was Shri Krishna. 3. Report about the excavations done by Dr. S.R. Rao of the Marnie Archaeology Unit of the National Institute of Oceanography of India.